Western Whiskey Gazette (WWG): "Patant"
A couple of weeks ago a buddy of mine stopped by. I'd lent him a hand a with a deal a while back and, being the generous sort that he is, said he had something for me as a thank you. He pulled out a brass plate which had been dug in San Francisco during the early 1960's. I'd seen this same exact piece before, in a closet collection, and it had "spoken to me". You know the feeling. You can't quite put your finger on it, but you know that what you're holding is something special, very special. It could be the just dug neck and partially embossed shoulder shard of a glop top whiskey, which has just enough embossing to reveal that it was once an "Old Signet", or the oddly shaped base shard of what later was determined to be a Cassin's Bitters. Like I said, you know the feeling. And so, I placed it on the shelf with other neat stuff that I've dug and hoarded over the past 45+ years, taking it's place of honor alongside a turn of the century Nevada aluminum hunting license, a brass hotel room tag and skeleton key from "The Annex" in Salinas Ca., a celluloid campaign button pushing William A. Massey's bid for Nevada US Senator in 1912, and a coin pouch dug from the bowels of a turn of the century outhouse in the Sierras, just to name a few. "Patant". What the heck was Patant? And who was A. C. Taylor. And what was this odd brass medallion doing in the bay muck alongside Gold Rush era "stuff"? I just finished a month long project, it's pouring down rain today , so I figured I'd spend a little time wandering down the halls of history. I didn't get off to a very good start though, since a search of the word "Patant" came up blank. I was guessing that it was a noun. Type in Patant into any search engine and it immediately defaults to "patent". Could it be foreign? French maybe? Same thing - patent. During the next half hour of cross referencing and trying to associate the word Patant with anything, I learned more about patents than I ever wanted. I was stuck in a revolving door called the internet. Focus, I told myself. And so I stepped out, caught my breath, and figured I'd dig into A. C. Taylor's past instead. It should be a no brainer since San Francisco is prominently stamped into the brass. 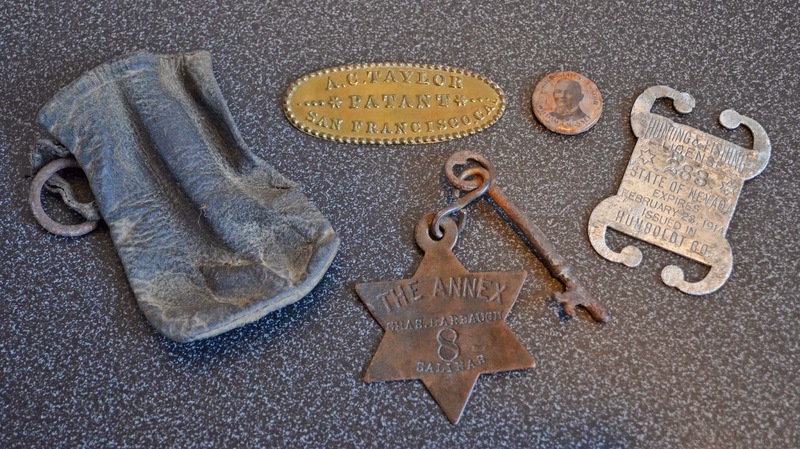 An online search for A. C. Taylor / San Francisco, was as fruitless as the "Patant" search. Nuthin'! Lots of Taylor this, or Taylor that, but no A.C. I tried the archives of the S. F. Call and the S. F. Daily Alta California. Zip. Nada. Whoever this A. C. Taylor was, he didn't advertise or expose himself to the limelight. Frustrated with my lack of success so far, I figured I'd try the San Francisco directories. But where to start... Common sense said early - early, since the strata that the item came from was surrounded by Gold Rush era artifacts. 1850 is as far back as the directories go. Seemed like a logical starting point to me. It was! Sure enough, there was A. C. Taylor, in black and white - in 1850! In partnership with someone named Gordon. What they did, and what the rest of the gibberish was, I knew not. But I'd found him nevertheless; one of the earliest businessmen in the great City of San Francisco! There was no 1851 directory, but the 1852 Morgan edition, and the subsequent 1852 - 1853 combined directories cleared things up nicely. Stoves and tin ware; supplemented by 70,000 pounds of oats. In 1854, A. C. Taylor disappeared from the directory. Thinking that maybe he'd left town and Gordon had taken over, I searched for a listing for him in the "G's.. But I overshot by mistake, and ended up in the "H's". "Ho" to be precise. What I saw nearly knocked me out my chair! Note, it doesn't state "res" (residence) or "dwl" (dwelling), as was customary in the directories if he was just living there. And this is a business listing. Did he actually own, and or run, the boarding house as the listing implies? Has an unwritten chapter in the life of A. P. Hotaling just been opened?! According to Wilson, "A. P. came to California in 1852, tried his hand at mining and in 1854 became a clerk with J. W. Griffin Liquors at 154 Sansome; purchasing the firm in 1856." Thomas said basically the same thing except that he put Hotaling back in San Francisco in 1853, beginning in the wine and spirit business then at the corner of Sansome and Jackson Sts. Back to A. C. Taylor and the brass plate. There was / is no 1855 directory, but I picked up snippets from the earlier days, in ship manifests, which showed A. C. onboard different steamers arriving in S. F. via Panama and from "around the Horn" so perhaps he liked to travel, or had relatives back east. Regardless, he appears again starting in the 1856 directory as a sole proprietor. The 1859 directory lists him as Augustus C. Taylor. Mystery of first name solved. Finally, in 1861, he is relisted at a different address (still on Montgomery St.) but as an importer. And then the trail goes cold. What did "Patant" mean? Was it a mis-spelling that was discarded once the mistake was noticed? And what was the purpose of the brass plate? We may never know. But one thing is for sure, we have A. C. Taylor to thank for perhaps adding another chapter to the early part life of A. P. Hotaling's life! Great story Bruce, you never cease to amaze me with the amount of research you do to get the full story! Your knowledge and access of the proper tools for researching a particular item is very impressive. Keep up the good work, I enjoy your writings. By the way, that yellow green J. Moore is an absolute screamer, right up there with Tom's example. The OPS is also a real beauty! Love that whittle.